Snobby Tours Travelblog: St. Patrick's Day - A Boost for Ireland Tourism and the Consumption of Pints of Guinness, the Chicago River Runs Green, and "Bogus Shamrocks"
St. Patrick's Day - A Boost for Ireland Tourism and the Consumption of Pints of Guinness, the Chicago River Runs Green, and "Bogus Shamrocks"
On St. Patrick's Day—Thursday, March 17—millions of people will don green and celebrate the Irish with parades, good cheer, and perhaps a pint of beer. But few St. Patrick's Day revelers have a clue about St. Patrick, the historical figure, according to the author of St. Patrick of Ireland: A Biography. grins for the camera in New Orleans. On any given day 5.5 million pints of Guinness, the famous Irish stout brand, are consumed around the world. But on St. Patrick's Day, that number more than doubles to 13 million pints, said Beth Davies Ryan, global corporate-relations director of Guinness. "Historically speaking, a lot of Irish immigrants came to the United States and brought with them lots of customs and traditions, one of them being Guinness," she said. Today, the U.S. tradition of St. Patrick's Day parades, packed pubs, and green silliness has invaded Ireland with full force, said Freeman, the classics professor. The country, he noted, figured out that the popularity of St. Patrick's Day was a good way to boost spring tourism. "Like anybody else," he said, "they can take advantage of a good opportunity." Who Was the Man Behind St. Patrick's Day? around A.D. 390 to an aristocratic Christian family with a townhouse, a country villa, and plenty of slaves. What's more, Patrick professed no interest in Christianity as a young boy, Freeman noted. "It was just horrible for him," Freeman said. "But he got a religious conversion while he was there and became a very deeply believing Christian." According to folklore, a voice came to Patrick in his dreams, telling him to escape. He found passage on a pirate ship back to Britain, where he was reunited with his family. The voice then told him to go back to Ireland. "He gets ordained as a priest from a bishop, and goes back and spends the rest of his life trying to convert the Irish to Christianity," Freeman said. Patrick's work in Ireland was tough—he was constantly beaten by thugs, harassed by the Irish royalty, and admonished by his British superiors. After he died on March 17, 461, Patrick was largely forgotten. But slowly, mythology grew around Patrick, and centuries later he was honored as the patron saint of Ireland, Freeman noted. According to St. Patrick's Day lore, Patrick used the three leaves of a shamrock to explain the Christian holy trinity: the Father, the Son, and the Holy Spirit. Today, St. Patrick's Day revelers wear a shamrock out of tradition. But people in Ireland hoping to wear an authentic shamrock are running low on luck. Trifolium dubium, the wild-growing, three-leaf clover that some botanists consider the official shamrock, is an annual plant that germinates in the spring. Recently, Ireland has had two harsh winters, affecting the plant's growth. "The growing season this year is at least as delayed as it was last year, and therefore there is the potential for shortage of home-grown material," John Parnell, a botanist at Trinity College Dublin, said in an email. "We have had frost and snow showers in parts of Ireland within the past week," he added. Other experts pin the shortage of the traditional plant as much on modern farming methods and loss of traditional hay meadows. "The cold winters we are having here lately are just another nail in the coffin,"Carsten Krieger, a landscape and nature photographer whose books include The Wildflowers of Ireland, said via email. To make up for the shortfall, many sellers are resorting to other three-leaf clovers, such as the perennials Trifolium repens and Medicago lupulina. According to theIrish Times, these plants are "bogus shamrocks." Trinity College's Parnell agreed that Trifolium dubium is the most commonly used shamrock today, which lends credence to the claims of authenticity. However, he added, the custom of wearing a shamrock dates back to the 17th and 18th centuries, and "I know of no evidence to say what people then used. I think the argument on authenticity is purely academic—basically I'd guess they used anything cloverlike then." What's more, botanists say there's nothing uniquely Irish about shamrocks. Most clover species can be found throughout Europe. Another St. Patrick myth is the claim that he banished snakes from Ireland. It's true no snakes exist on the island today, Freeman said—but they never did. Ireland, after all, is surrounded by icy ocean waters—much too cold to allow snakes to migrate from Britain or anywhere else. Since snakes often represent evil in literature, "when Patrick drives the snakes out of Ireland, it is symbolically saying he drove the old, evil, pagan ways out of Ireland [and] brought in a new age," Freeman said. The snake myth, the shamrock story, and other tales were likely spread by well-meaning monks centuries after St. Patrick's death, Freeman said. St. Patrick's Day: Made in America? Until the 1970s, St. Patrick's Day in Ireland was a minor religious holiday. A priest would acknowledge the feast day, and families would celebrate with a big meal, but that was about it. "St. Patrick's Day was basically invented in America by Irish-Americans," Freeman said. 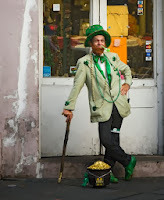 Irish-American history expert Timothy Meagher said Irish charitable organizations originally celebrated St. Patrick's Day with banquets in places such as Boston, Massachusetts; Savannah, Georgia; and Charleston, South Carolina. Eighteenth-century Irish soldiers fighting with the British in the U.S. Revolutionary War held the first St. Patrick's Day parades. Some soldiers, for example, marched through New York City in 1762 to reconnect with their Irish roots. Other parades followed in the years and decades after, including well-known celebrations in Boston, Philadelphia, and Chicago, primarily in flourishing Irish immigrant communities. "It becomes a way to honor the saint but also to confirm ethnic identity and to create bonds of solidarity," said Meagher, of Catholic University in Washington, D.C.. Sometime in the 19th century, as St. Patrick's Day parades were flourishing, wearing the color green became a show of commitment to Ireland, Meagher said. In 1962 the show of solidarity took a spectacular turn in Chicago when the city decided to dye a portion of the Chicago River green. The tradition started when parade organizer Steve Bailey, head of a plumbers' union, noticed how a dye used to trace possible sources of river pollution had stained a colleague's overalls a brilliant green, according togreenchicagoriver.com. Why not use the dye to turn the whole river green on St. Patrick's Day, Bailey thought. So began the tradition. The environmental impact of the dye is minimal compared with pollution such as bacteria from sewage-treatment plants, said Margaret Frisbie, the executive director of the advocacy group Friends of the Chicago River. Rather than advising against the dye, her group focuses on turning the Chicago River into a welcoming habitat full of fish, herons, turtles, and beavers. If the river becomes a wildlife haven, the thinking goes, Chicagoans won't want to dye their river green. "Our hope is that, as the river continues to improve, ultimately people can get excited about celebrating St. Patrick's Day different ways," she said.